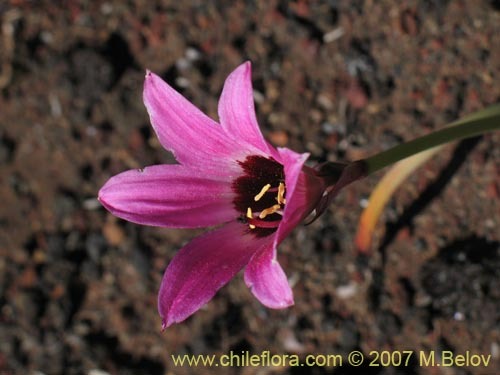 This is a Rhodophiala of the Southern Andes of Chile, very characteristic of the volcano landscapes - it has rather small flowers, pinkish-red in color, which generally do not open as much as the other Rhodophialas (they are bell-shaped), giving thus an impression of being even smaller (this may be the result of the harsher climate). It may be less impressive than the other Rhodophialas due to its smaller size of the flower, short stems, and the fact that the flowers are solitary, but it is surprising how well this plant copes with the harsh conditions of the high mountains and barren soils - it is indeed a special pleasure to discover a delicately looking flower on a black lava slope covered with razor-sharp stones"
This is a perennial bulbous plant of about 15 - 25 cm. The leaves are present during the flourishing. The leaves are linear, thick 15 - 25 cm long and about 7- 8 mm wide. 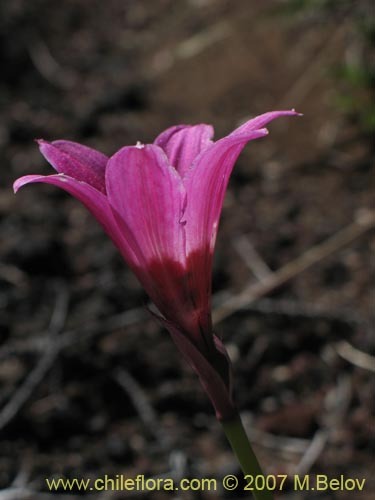 The plant has delicate pinkish-red flowers with darker stripes. 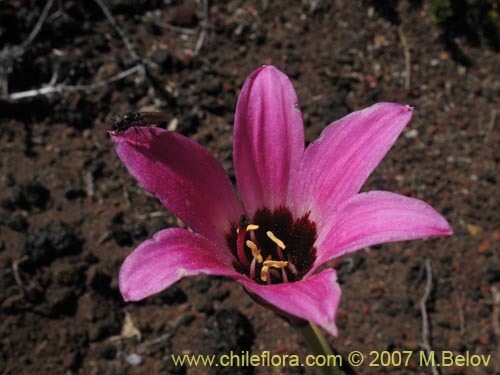 The flower can be as big as 10 cm in diameter and has six yellow stamens and one pinkish pistil which is quite longer than the stamens, and the flowers are solitary (this differentiates them from the other two commonly found Rhodophialas - the splenderosa, andbakeri). The seeds come in a three-parted greenish-brown capsule which contains about 20 - 40 shiny black flat round seeds of 1 cm of diameter stacked up one on the other like pages of a book. The flowers appear in December - January, generally later than other Rhodophialas, and the seeds are ripe in February-March. This plant gows at higher elevations in Southern Chile (Volcan Llaima: 1500 - 1800 m), just above the tree line, sometimes mingling with the more audacious Araucarias; it prefers sunny spots and grows generally on volcanic sand or semi-desintegratedlava fields with good drainage. 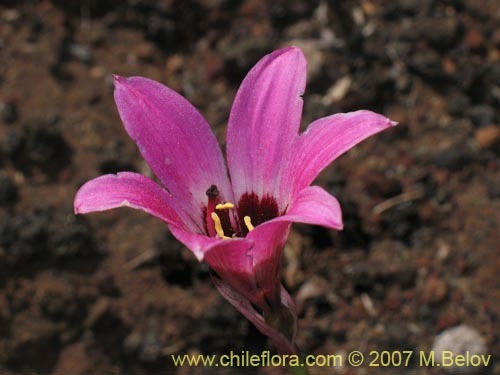 It needs a lot of water during its vegetative growth (in spring), but during the flowering it can withstand dry spells of up to one month (the bulbs store nutrients and water necessary for flowering). It can be easily propaged by seeds or by division of bulbs. The seeds must be immersed in water for a day o two and then stratified in damp sand for four to eigth weeks at 5ºC. 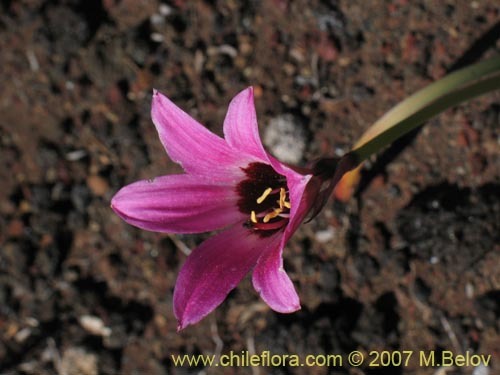 Then, the seeds are planted in warmer soil (15ºC) with poor organic content, preferibly volcanic sand. If volcanic sand is not available, perlite-type substrate may work as well (do not overfertilize"). Do not expect flowers for at least two seasons, because the bulb needs time to develop.